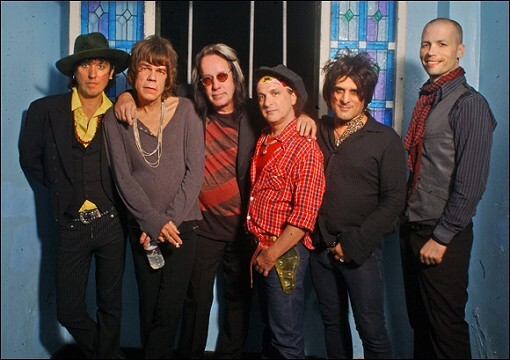 The New York Dolls and legendary record producer / rock star, Todd Rundgren have been reunited for the first time in 36 years. Rundgren will produce the Dolls’ new album at his studio on the island of Kauai. Production is scheduled to start in January 2009. This is the first time in 36 years since Rundgren originally produced the New York Dolls eponymous debut album “The New York Dolls” which included the classic songs “Personality Crisis”, “Trash”, “Jet Boy” and “Private World”. Rundgren will be reunited with original Dolls founding members, David Johansen (vocals) and Sylvain Sylvain (guitar, vocals). The album, which is yet untitled, will be released on the Atco label through Warner Brothers. The Atco label has been specially re-launched. The New York Dolls are one of the first signings to the label. The Dolls will follow the release of the new album with a world tour in 2009. The New York Dolls are playing the Stone Pony on November 22, 2008 and The Fillmore at Irving Plaza on December 27, 2008 (buy tickets). Todd Rundgren is playing a two night stand at the Blender Theater on December 26 and December 27, 2008 (buy tickets). More Rundgren and Dolls dates after the jump. PS Is it just me, or is David Johansen a ringer for Nardwuar The Human Serviette? The first Dolls album was a classic. If Todd can recapture the same energy that the Dolls displayed on Personality Crisis and Jet Boy, than this could be better than the original line up of Kiss reforming, or Robin Zander singing lead vocals for Led Zeppelin. Almost legendary. Can’t wait! Reports from Rundgrenland, actually from Todd himself indicate this will be the best New York Dolls record ever.